Vauxhall recommend replacement every 48,000 miles or 5 years. Crankshaft locking pin – Kent Moore No.6031. Injection pump sprocket locking tool – Kent Moore No.6032. Engine support – Kent Moore No.6210. NOTE: No.1 cylinder is at flywheel end. Unclip fuel feed pipe from RH engine mounting. Move to one side. NOTE: Auxiliary drive belt(s), tensioner pulley and guide pulley(s) MUST be replaced. Bolt from cylinder block  . 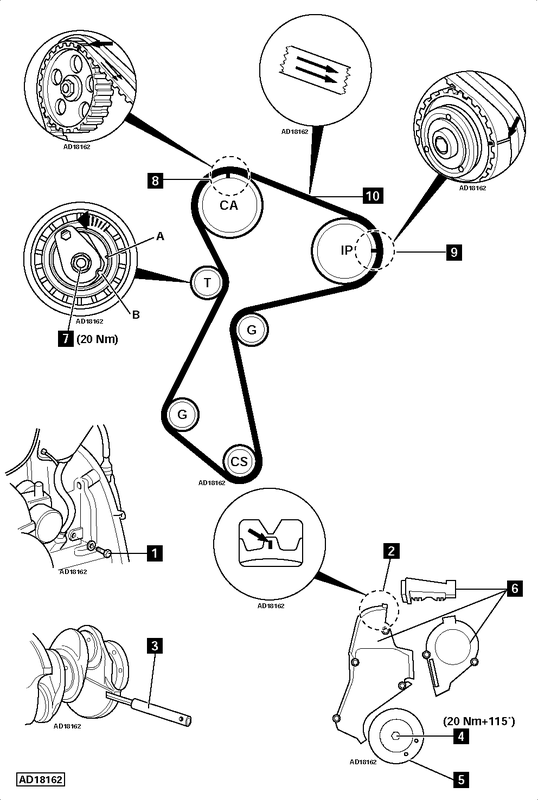 Turn crankshaft clockwise until camshaft sprocket timing mark aligned with mark on timing belt cover  . Fit crankshaft locking pin  . Tool No.6031. Ensure marks on belt aligned with marks on sprockets  &  . Fit suitable flywheel locking tool. Fit injection pump sprocket locking tool. Tool No.6032. NOTE: Timing belt, tensioner pulley and guide pulleys MUST be replaced. Fit timing belt. Ensure marks on belt aligned with marks on sprockets  &  . Ensure belt is taut between sprockets. Remove locking tool from injection pump sprocket. Turn tensioner pulley anti-clockwise until marks aligned [A] & [B] . Use 6 mm Allen key. Tighten tensioner nut  . Tightening torque: 20 Nm. Insert crankshaft locking pin  . Ensure tensioner pulley marks aligned [A] & [B] . If not: Repeat tensioning procedure. Fit new crankshaft pulley bolt  . Tightening torque: 20 Nm + 115°.